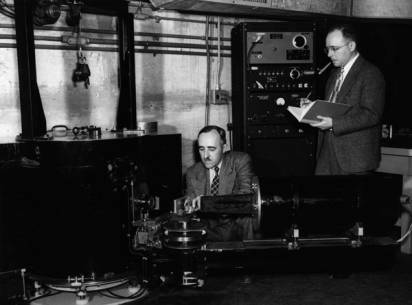 Clifford Shull (standing) with Ernest Wollan at Oak Ridge, c1950. Image courtesy of Carnegie Mellon University Archives. Carnegie Mellon's University Libraries are pleased to announce electronic access to portions of the research and papers of Nobel Laureate Clifford Glenwood Shull. Dr. Shull’s career spanned some of the most pivotal moments in nuclear physics, including an invitation to work on the Manhattan project (which he had to decline) and post-war Atoms for Peace programs. The Clifford Glenwood Shull Collection encompasses the career of a prominent nuclear physicist who was not only a major researcher in his field, but also dedicated his career to the education and training of talented younger physicists. A generous grant from the family of Dr. Shull has allowed the University Libraries to scan the Shull papers and make them available online. The University Libraries are grateful to the Shull family for their support of our digital archives initiatives.